Magic Moments – Run. Ride. Roam. What a difference a day makes! What an absolutely magical ride we had today. First of all the sun was shining and second of all, the wind wasn’t blowing. What a top start to the day! 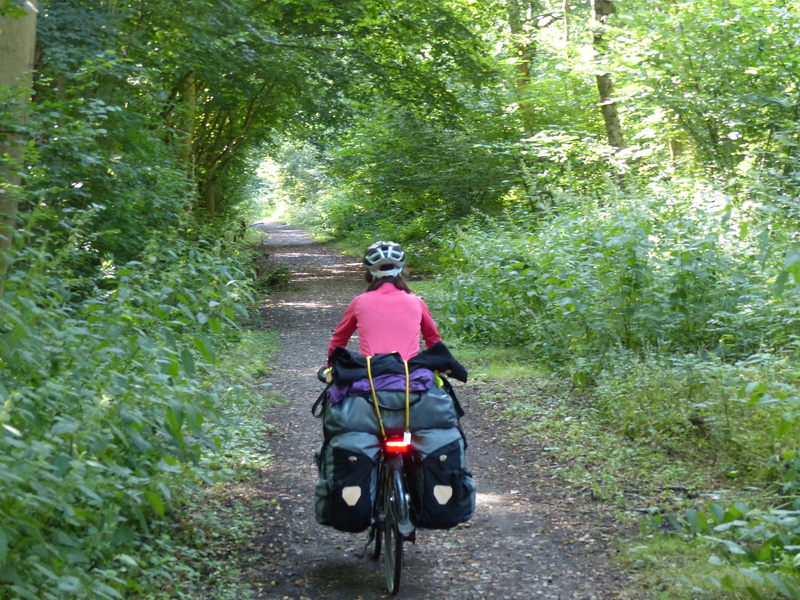 We set off out of charming Cranleigh and our route took us back to the lovely, tree lined, forested, off-road path that we rode in on yesterday. 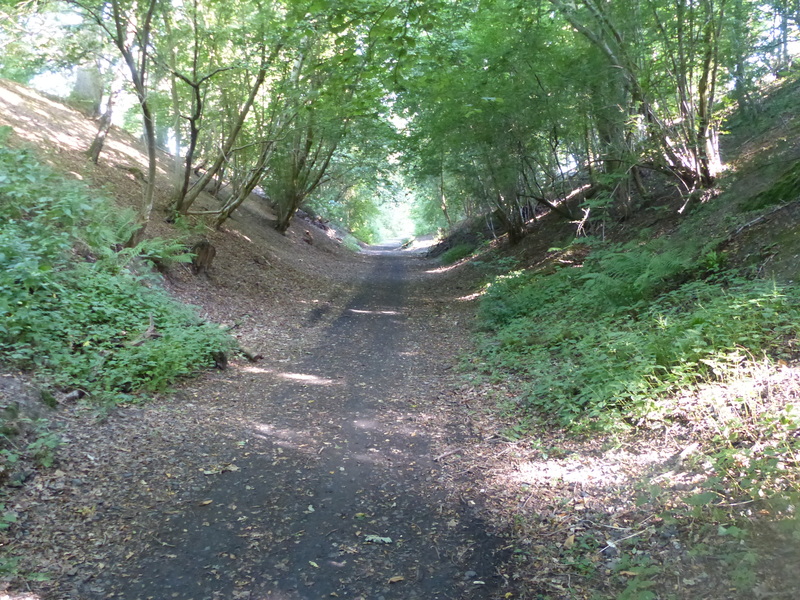 This path, the Downs Link, became our route for virtually the whole ride. 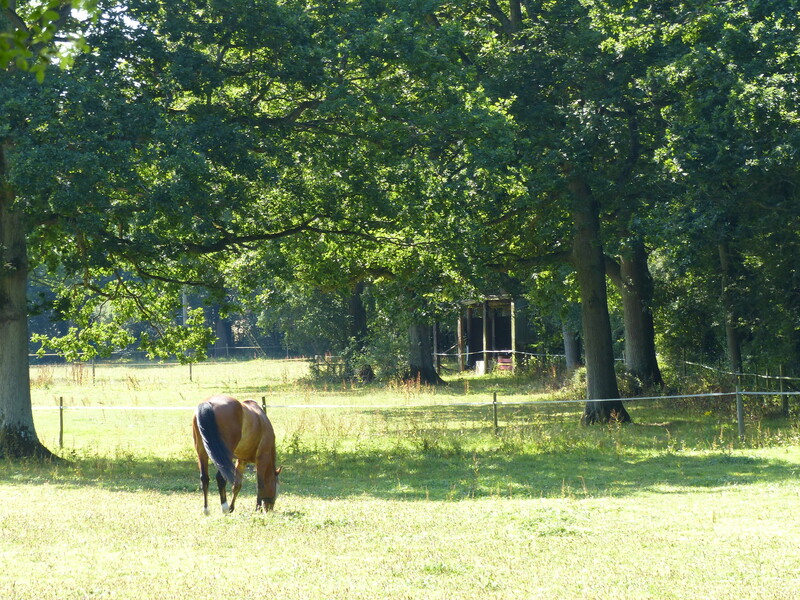 It was peaceful, not cold, the dappled sunlight filtered through the greenest of green leaves, the wheat fields were an oil painting beside us, the horses grazed peacefully in the passing fields and the birds twittered and sung in the trees all around us. Magic. 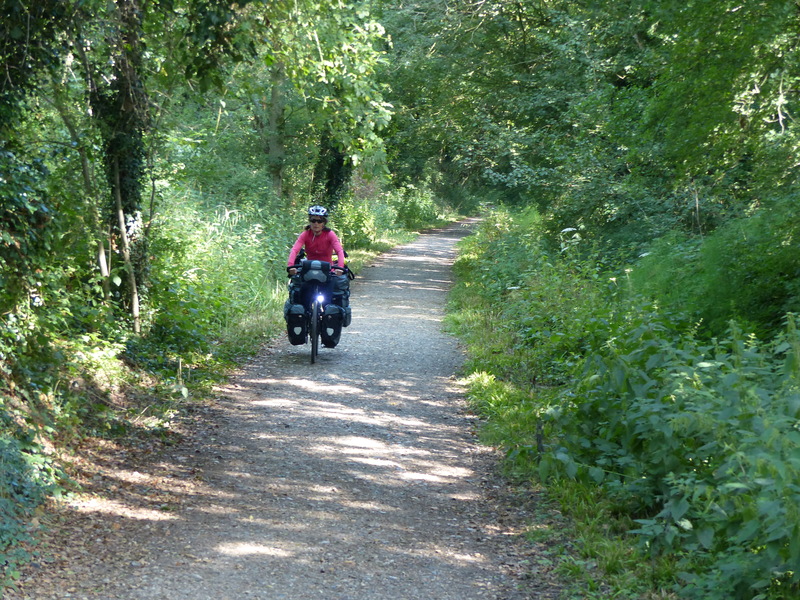 We happily pedalled along this tranquil path, beside trees and flowers and under abandoned railway arches and instead of adding layers of clothes, I actually started peeling layers off, it felt that warm. Magic. We rode into the town of Southwater and stopped for elevenses on a bench in the town centre. Unfortunately at this point, the clouds arrived and the layers went back on. Still, it wasn’t really cold and we had a nice elevenses, watching the towns folk walking by and going about their business. Off we went, back along the Downs Link, the sun reappeared and the new layers found themselves off again and strapped to the back of the bike. The path threw in a couple of pretty steep sections, that required a dismount and a push of the bike to get up them. This was only because the path was rocky and the wheels kept spinning in the gravel on the steep hill, causing me to go absolutely nowhere in a forward or upward direction. The walk and push strategy was unavoidable at that point. 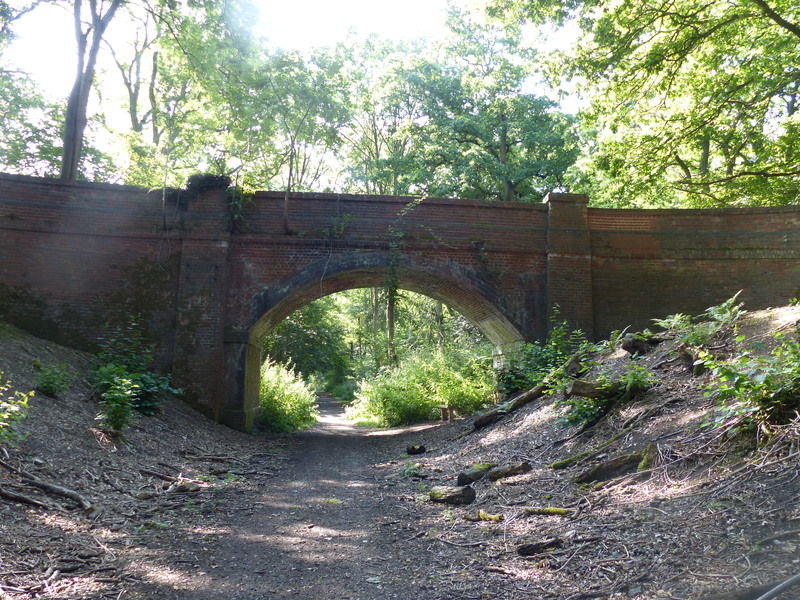 As we pedalled under another grand, brick railway arch, we had a glitch in the magic. Steve got a puncture. Another puncture. His fourth puncture for the trip. 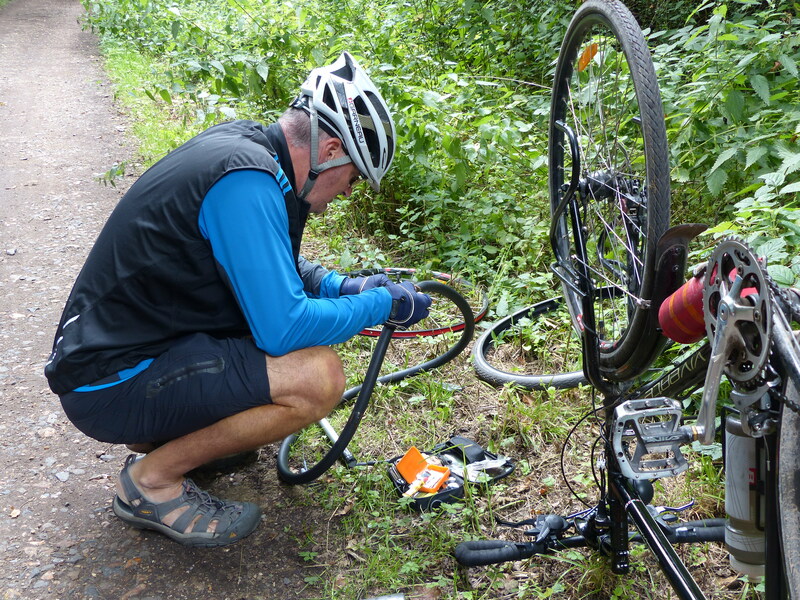 We pulled over on the path and Steve set about unloading the bike, flipping it upside down, taking off the wheel, taking off the tyre, removing the tube and trying to find the site of the puncture. He eventually handed the tube to me, so another set of eyes and ears could have a go at finding the pesky hole. After some squeezing and with ear to rubber, I heard the distinctive sound of air leaving the space where it should actually be staying put. The hole was found. Steve tried patching it, it didn’t work, so instead he had to change the entire tube. This little interlude put a bit of a blip in the ride and I really hope Steve’s tyres stay up and intact for tomorrow’s ride because that was his last spare tube. If he gets another puncture before we can get to a bike shop, I may find myself piggy-backing Steve, carrying six extra bags and balancing a large puncture-prone bike on my handlebars for the onward journey to a repair shop! Punture number 4. Steve’s not happy with his fancy schmancy tyres that keep puncturing when his “lesser brand” ones have been puncture-free for thousands of km’s! Puncture finally fixed, we pedalled off again, with our peaceful path taking us onto the road occasionally, but the roads were fairly quiet, so it was still a really nice ride. The only teeny weeny problem with riding along these sorts of paths, is they bypass villages, so while we are happily riding along through wooded trails in peace and tranquility, there are villages and towns somewhere out there, that we aren’t seeing and there aren’t signs on the path to say they’re there. So while we gain a lovely, quiet off-road path, we may also lose out on seeing some other nice places too. The path wasn’t quite finished throwing us some curve balls though. It also gave us Stinging Nettle Alley. We waddled our way through a gate in the path and there in front of us appeared a narrowing of the path, with a bumper crop of stinging nettles along the side. 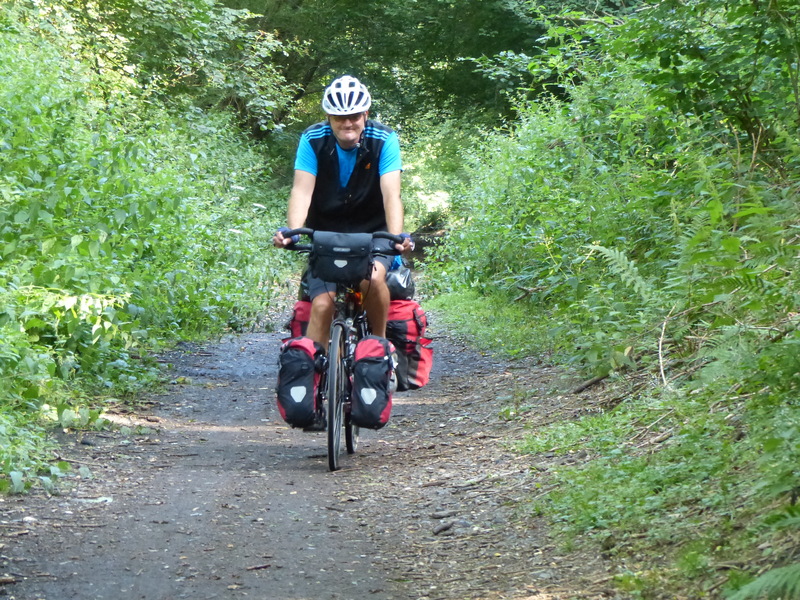 At least I had leggings on, because Steve was in shorts, with bare legs tantalising those nettles. I stopped. I looked. I psyched myself up. 1…2…3…”GO! GO! GO!” I shouted, “please don’t sting! please don’t sting! please don’t sting! please don’t sting! please don’t sting!” I called out to the foliage beside me, “stay back nettles! stay back nettles! 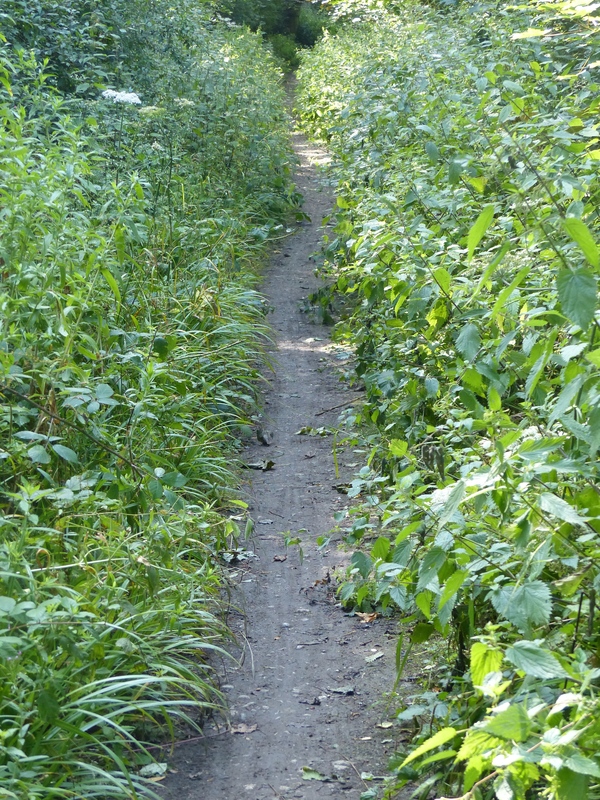 stay back nettles!” I shouted repeatedly as I pedalled for all I was worth, to get through that alley of stinginess as quickly as I could. We both made it out the other side unscathed, which I put down to the gang of nettles being scared into submission by my ridiculous shouts and cries! Whatever works! With campsites in this area being few and far between, it was going to be a case of taking what we could find, so after only 37km of riding, we arrived at our pitstop for the day. We are in the tiny, “blink and you’d miss it” village of Small Dole. Our campsite is nothing more than a field and the village is nothing more than a village shop / post office, village hall and a pub. That’s it. We arrived about 2:00, very, very early and sat in the sunshine (it was still there!!) and had lunch, before pitching the tent. After a stroll into the tiny village to gather some very meagre supplies from the village store, we spent some time just sitting in the sun. “This is what it’s supposed to be like!” we voiced in unison. Sunshine, shorts and t-shirt, sitting on our chairs beside a hedge with the cows noisily munching on the other side, having a cuppa and just taking it a little bit easy. Magic. I’m not seeking shade, I’m hiding my legs because they’d scare the cows! What a top day. The sun shone and the spirits soared. I was back to my mid-ride exclamations of “Beautiful! It’s magic! Isn’t it lovely! I love this!” which had been absent from our rides of late. There’s no need to put a positive spin on the events of the day, because they just sparkled all on their own. I guess I just have to remember that when the going gets tough, the tough will eventually, at some point, in the future, finally, sometime, be replaced with some magic! It’s just a matter of waiting for the magic to happen. Patience, just wait, ride it out, and…magic! Glad I could give you a “good belly chuckle” – you have given me quite a few. And SO HAPPY FOR YOU that the sun is still able to shine. My goodness there were a lot of nettles on that stretch!! 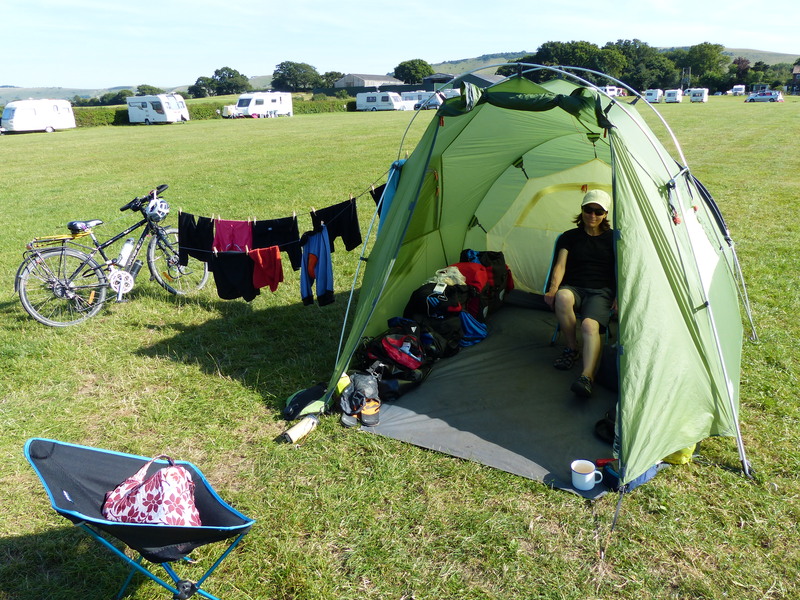 Looking at the photo of your campsite … looks like it is much better to have a tent ….. you have heaps of room around you ….. all the fancy shmancy vans are crowded together hahahaha. Sun is awesome! We did get neighbours on either side of us after the photo was taken, but we still had heaps of space, so that was t’riffic!